Merry Christmas Eve! It’s been 5 years since my last Christmas-themed score mix, and I’ve heard so much great stuff since then I decided it was time for another! “More Scores of the Season” contains 80 minutes of Christmas-y, holiday, and snow-related score tracks, many of them putting a new spin on Christmas staples, carols, and the Nutcracker Suite. 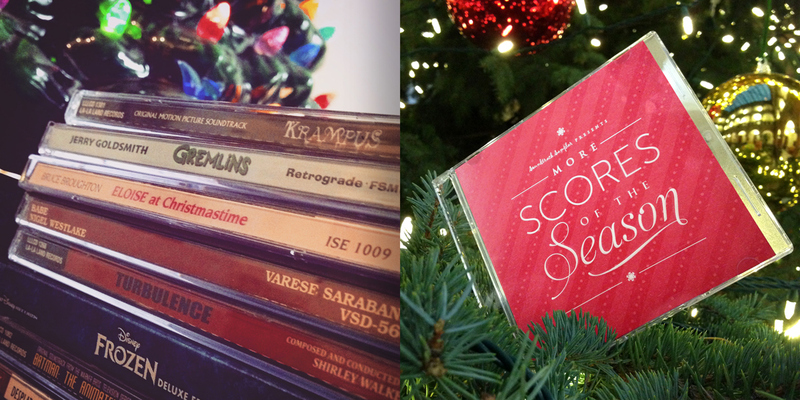 From the super festive (Bruce Broughton’s “Eloise at Christmastime”, William Ross’ “A Very Harold & Kumar 3D Christmas”), to the more somber (John Debney’s unreleased work from “I’ll Be Home for Christmas”), from nostalgia-filled (Johnny Mark’s iconic tunes from the “Rudolph the Red-Nosed Reindeer” special, Jerry Goldsmith’s classic themes from “Gremlins”), to the darker side of the holidays (Shirley Walker’s “Turbulence”, Douglas Pipes’ end titles from this year’s “Krampus”), and a bit of everything in between (Nigel Westlake’s “Babe”, Christophe Beck’s “Frozen”), the mix runs the gamut. It’s good “last-minute-wrapping” music. wink emoticon Give it a spin and break out the ‘nog!